Following the surgical implantation and fusion of the implant post or posts, patients will return to our office to have a replacement tooth or teeth attached to the implant posts. Patients missing one to four consecutive teeth will likely need an implant supported crown or fixed bridge. A single tooth can be replaced by attaching one dental crown to a fixed bridge. In many situations, we’ll fuse two replacement teeth together and attach them to a single implant post as well. Those with three or four consecutive lost teeth will have a row of fused together replacement teeth with a dental implant providing support at either end of the restoration prosthetic. 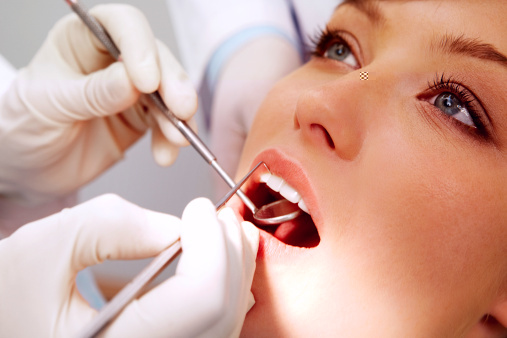 In some cases, we may use a series of fixed bridges and crowns to replace numerous teeth. However, it’s much more common for patients with more extensive tooth loss to replace missing teeth with a partial or full denture. Patients missing numerous consecutive or nonconsecutive teeth may want to consider a less invasive solution with implant supported partial or full dentures. Both forms of denture are crafted by using a gum-like base material to support a number of replacement teeth. Partials are shaped to fill in smile gaps and full dentures are placed to fit over the gum line and replace a full row of teeth. Partials or full dentures can typically be supported with four to six implant posts. The dental implant tooth replacement process is completed in two main phases. Both phases of treatment can require two or more visits to our office. In the initial phase of treatment, one or more dental implants are surgically placed below the gum line. The length and complexity of the surgical procedure itself varies drastically depending on the number and location of missing teeth, but the implantation process itself remains the same. We will need to make a small incision into the gum tissue where the titanium implant will be inserted into the jaw bone. Then, we attach a protective cap that performs two main functions. It allows the implant site to heal, and it maintains the shape of the gum tissue to allow for the connection of abutments and tooth replacement prosthetics. After the implantation procedure, patients will need to wait for three to six months for the implant to fuse with the supportive gum and bone tissue. This fusion process allows the implant post or posts to closely mimic the lost tooth root structures.